A quick and tasty appetizer - no plate required! MIX in a small bowl 1/4 cup each: Miracle Whip Original Spread, Kraft Smooth Peanut Butter and chicken broth, 2 tbsp. each: honey, soy sauce, a dash of garlic powder and a few drops of Tabasco sauce. Set aside half the sauce for dipping. 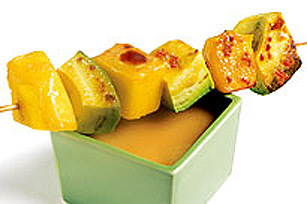 THREAD chunks of avocado and mango onto 8 wooden skewers and brush with peanut sauce. GRILL or broil about 4 minute per side or until lightly browned. Serve with dipping sauce.